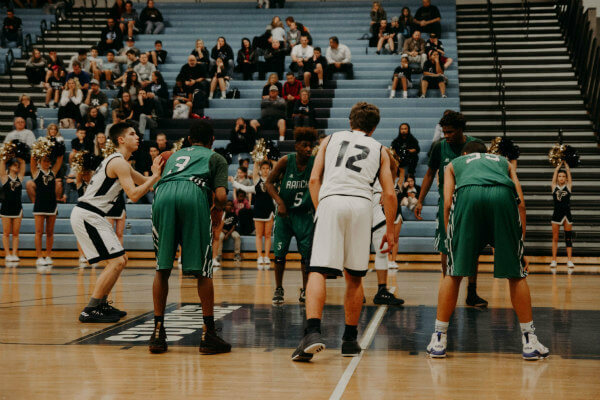 Every season games are won and lost at the foul line. Yet, free throw basketball shooting is an overlooked and underdeveloped skill for many players. At every level, from youth basketball to the pros, the ability to sink it from the line often separates the championship teams from the rest. So, what's the secret to good free throw shooting? It's simple really. Take the ball from the ref. One deep breath. Three small dribbles. Ball in shooting pocket. One deep breath while focusing on the rim. Shoot. Eyes on rim. Hold the follow through. My basketball shooting form was so automatic that even after all these years, I can still step up to the line and perform it exactly the way I did during my last college basketball game. From a technical standpoint, a free throw is a set shot. So, the first step to becoming a clutch shooter is by mastering the fundamental mechanics of a set shot. From a spectator's point of view, a free throw looks pretty easy. I mean, how hard could it be? But that's just it. That's exactly what makes it so difficult for a lot of players. The shooter goes from full speed to a dead stop and is often winded when stepping up to the line. Instead of shooting off a move, they are expected to shoot standing still. All eyes in the gym are on them. There's a lot of pressure to make the shot, especially in a close game. There's nothing like a made free throw at a crucial time to build confidence and swing momentum for a team. And likewise, a missed free throw when a team desperately needs a score can kill a team's morale. Even the most well-practiced shooter is going to miss sometimes. That's just the nature of the game. But with practice, especially using drills involving pressure situations (where missed shots have negative consequences), players can learn how to improve their accuracy in clutch situations. How do your players compare? There's an excellent program I used with my teams called 80%: How You Can Shoot Foul Shots Better Than the Pros by Peter Greider. Greider says, "The one most important thing that determines success or failure at the foul line is how you're feeling right before you shoot. And what determines how you're feeling? What you're thinking." And that's what separates great free throw shooters from poor ones. A player may have the best shooting mechanics in the world, but if her frame of mind isn't right when she steps up to the line, her basketball shooting technique isn't going to matter much. Success at the line depends a whole lot on what's going through a player's mind in the moments before they shoot. That's how powerful the mind is. Sinking foul shots is difficult for a lot players because they have too much time to think. During the normal flow of the game, players put up shots without thinking about them. They don't have time to think because they're too busy reacting to the dynamic environment around them. But, during a free throw, everything stops. The environment becomes static. Every basketball player should come up with their own routine. It's best if they keep it simple. They have ten seconds to shoot which is plenty of time. Don't rush it. The important thing is, once they come up with one that's comfortable, encourage them not to change it. In crunch time, coaches need players on the floor who have confidence at the line and can get the job done.